When Steve Jobs evaluates something, it's either "insanely great" or an expletive that's unpublishable here. This relentless perfectionism typifies how Steve views everything he has created in 28 years at Apple Computer and nearly 20 at Pixar Animation Studio. It also explains why he has been successful again and again in creating breakthrough products. Steve, 50, helped bring digital technology to the masses and revolutionized several industries. He didn't invent the personal computer. But he was the first to look at a utilitarian tool for techies and reincarnate it as something that became ubiquitous in classrooms and dens. He didn't conceive of the portable music player. But he re-engineered it so that millions suddenly said to themselves, "I need that." Animated film had been around for nearly a century. But he helped transform the category to the point where Best Animated Feature was added to the list of Oscar categories. Steve's recipe for success? He's a marketing and creative genius with a rare ability to get inside the imagination of consumers and understand what will captivate them. He is obsessed with the user's experience. For every product his companies have released, it's clear that someone actually asked, How can we "think different" about this? How can we innovate on an idea to make it appeal to mass audiences, to make it look cooler, easier to use, truly unique? Indeed, Steve's hallmark is trendsetting design. Whether it's the original Macintosh, the iMac, the iPod, the flat-panel monitor, even the Apple operating system, most of the company's products over the past three decades have had designs that are three steps ahead of the competition. When Steve bought Pixar, it didn't seem a stretch that he could create an animation studio despite never having made a film in his life. In the feature-movie business, marketing and creativity are the rules of the road. So in his inimitable style, Steve partnered with Pixar's brilliant creative and technology teams. The studio's approach to computer-animated design brought a photorealism to animated film that soon became the industry standard. And Pixar places the highest premium on great storytelling, which has enabled the company to help redefine animation as it breaks box-office records. 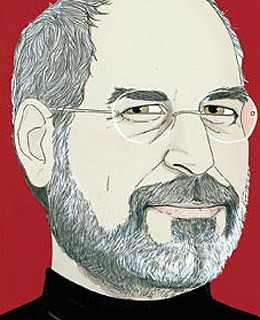 Steve's brilliance as an innovator and marketer has revolutionized several industries. Whereas most creative people have just one big hit inside them, Steve has a drive and vision that renews itself, again and again. It leaves you waiting for his next move. Semel is the chairman and chief executive officer of Yahoo! Inc.